One of the things that makes Social Justice Fund unique is our five-state region. The reasons why are clear to our urban members once they participate in our grantmaking process and learn about the amazing work going on outside Seattle and Portland. The things that make rural organizing successful are important to all social change work, like holding a long-term vision, meeting people where they are, and deep relationship building. As a regional social change agent, we leverage and invest resources in Idaho, Montana, Oregon, Washington, and Wyoming. This kind of regional movement building is critical to issues like Medicaid expansion – while some states in the Northwest have passed expanded coverage, other states that have not are struggling. Medicaid provides healthcare for low-income children, pregnant women, and people living with disabilities, however, still leaves millions of low-income people uncovered. Dan Neal, Executive Director of Equality State Policy Center (ESPC) puts it this way, “Medicaid covers very specific groups of people. You could make no income, have a chronic illness like diabetes, but as long as you’re are not a child, a pregnant woman, or disabled, you don’t qualify for the Medicaid program”. Under the Affordable Care Act, states could receive federal funding to expand Medicaid to include coverage for all low-income people below 138% of the Federal Poverty Line. While almost half of the states passed Medicaid expansion last year, 23 states did not and four others are using an alternative to “traditional expansion.” Among the states that didn’t expand Medicaid are Wyoming, Montana, and Idaho; home to our grantees Equality State Policy Center, Montana Women Vote, and Idaho Community Action Network. For Wyoming, an estimated 18,000 people are left out of the Medicaid program. The numbers grow in Montana to roughly 70,000, and even higher in Idaho at 88,000. And it’s more than access to health services. The Wyoming Department of Health reported that Medicaid expansion reduce mortality by 111 lives each year”. That’s 111 people who could continue to live – every year – if they receive the care that expansion would provide them. Dan explains, “Not only is it the right thing to do, but it benefits the whole state”. State studies have found that Medicaid expansion would bring additional resources and jobs directly into the state economy. Gregg Davis at the Bureau of Business and Economic Research at the University of Montana reports, “For every $1 billion in federal funds, 18,600 jobs are created, labor income increases $690.3 million, business sales increase $1.5 billion, and drives state and local revenues up $872 million”. Although Wyoming legislators rejected Medicaid expansion in 2013, the fight is far from over. ESPC is working with a broad coalition of supporters and allies including local hospital and medical associations. The collaboration is an important one moving forward as they shift the strategy towards Medicaid expansion through a state budget amendment that authorized the governor to negotiate an expansion plan with the Centers for Medicare and Medicaid Services. A key voice in helping build the collaboration between ESPC and the hospital association was Sarah Howell, Executive Director of Montana Women Vote. Dan recalls, “Sarah really helped reassure and build trust during those conversations, and did a great job explaining the benefits of organizing together”. In 2013 Montana Women Vote and its allies coordinated a legislative campaign that brought together over 25 organizations working to expand Medicaid. Throughout their three months of work, they generated over 5,000 supportive contacts from Montanans to their legislators; 400 engaging in advocacy events at the State Capitol; 8,000 information sharing contacts to members and people affected by the issue; and 144 engaged volunteers. Since then, they’ve been working on a number of new strategies including a special legislative session, and recently launched the Healthy Montana Initiative, a citizen’s ballot initiative that could put the Medicaid expansion on the November ballot. Despite last years’ disappointing legislative session, Sarah’s optimistic and says, “We’re excited to be out talking to people across the state about putting Medicaid expansion on the ballot through the Healthy Montana Initiative. We know that the majority of our state supports accepting federal fund to provide affordable, quality health coverage to 70,000 low income Montanans and we can’t let politics stand in our way”. What’s next for Medicaid Expansion in the Northwest? 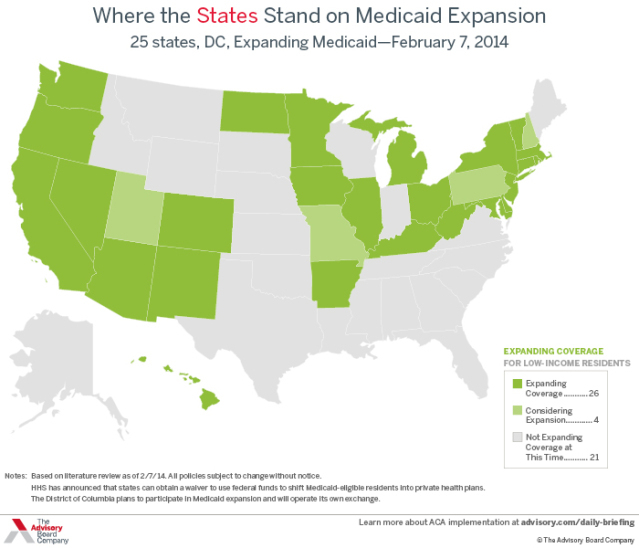 Strategies to implement Medicaid expansion vary from state to state. Learn where your state stands, and what local actions are taking place. If you’re in states that have passed Medicaid expansion, learn about regional efforts to support.